Don’t be misled by the title and jacket description of this book. They will have you believe that Caleb’s Crossing is about the first Native American to graduate from Harvard University in 1665. Don’t get me wrong – this is central to the story and is the reason Geraldine Brooks wrote this book. However, alongside it is the equally powerful story of the book’s narrator, Bethia Mayfield, and her detailed account of life as a woman in the mid-17th Century. People of the Book: A book lover’s delight – a book that tells the story of a centuries old book. Year of Wonders: The story of an English housemaid and her village during the 1666 plague. In Caleb’s Crossing, Brooks creates a work of fiction from scant historical fact. She goes to great lengths to recreate the life and times of the era, when Native Americans were commonly referred to as “salvages” and women were required to live in the shadow of men. She creates a strong contrast between the fiery spirit of Native American traditions and the sobering repression of English Puritan ways. While I enjoyed the story of Caleb, for me, Bethia’s story was the real drawcard of this book. As she narrates Caleb’s story and his “crossing” to English ways, Bethia also introduces us to the issues facing women of her era. It is saddening to see her sharp wit and intelligence silenced by the prejudices of her time. It also made me wonder: if women had been able to speak up throughout the ages, how different would the world be that we live in today? Thank you to Sarah for recommending this book to me. 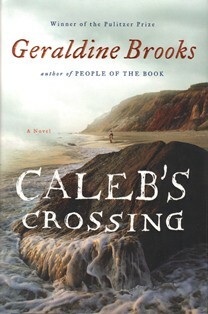 Would you like to read Caleb’s Crossing by Geraldine Brooks? Brooks does an excellent job of portraying the sorrow and hardships that both people faced in the time of colonization. She shows the difficulties of the colonists with acute vision and sympathy, while giving weight to their clumsiness and grave mistakes. She shows the beauty and simplicity of the Wampanoag way of life. In her words we feel the confusion of two peoples trying to live together, and all the misunderstanding and sorrow that ensues. Hi Portugal, thanks for the insight - you have captured it well. A great read. This book offers an original and inspired perspective on issues that mattered most in the 1600's, and still matter today, by a consummate story-teller. We look forward to reading Ms. Brooks' next book. This one is a lovely and tender story.